Webster’s online encyclopedia defines Jubilee as "the name used locally for a natural phenomenon that occurs from time to time on the eastern shore of Mobile Bay. During a jubilee, blue crabs, shrimp and fish swarm toward the shore in such numbers that the shallow water near land seems to boil with life.” For those of us who live on the Alabama Coast, it is a celebrated community event and a mysterious – and most welcomed – gift from nature. For visitors and locals on the Alabama Coast, this time of year offers a ‘jubilee’ of a different sort as the whole Mobile Bay area comes alive with an abundance of festivals and events - from art and music to coastal cuisine and outdoor activities. It’s a bountiful harvest just waiting to be caught. WATERWAY VILLAGE ZYDECO & CRAWFISH FESTIVAL & 5K RUN April 15, Gulf Shores | The Waterway Village Zydeco and Crawfish Festival boils up a beaucoup of fun in Gulf Shores. Locals and visitors are invited to sink their teeth into hot, juicy crawfish throughout the day while dancing to the infectious rhythms of some of the best Zydeco bands from around the South. There will be arts and crafts vendors and children’s activities. This third annual event is a result of a unique collaboration between the City of Gulf Shores, the Coastal Alabama Business Chamber, Gulf Shores and Orange Beach Tourism and Waterway Village merchants, including Acme Oyster House, Lulu’s, Tacky Jacks, Gulf Coast Arts Alliance, The Diner, ByWater Bistro, Big Beach Brewing Company and Wheeles Karate Academy. The festivities will kick off at 8 a.m. with the Zydeco and Crawfish Festival 5K benefitting Furrever Homes. The good times will roll all day long as the crawfish pots begin boiling at 10 a.m. and the Zydeco sounds will be grooving until 6 p.m.
DAUPHIN ISLAND GUMBO FESTIVAL April 28-29, Dauphin Island | Don’t miss the 8th Annual Dauphin Island Gumbo Festival. This Year’s Gumbo Festival will be April 28th and 29th outside of Fins and Pirate’s Bar & Grill! Tickets are only $10. All proceeds from this year’s cook-off will help build the new basketball courts on Dauphin Island and help fund other kids projects on Dauphin Island. This is an island event you won’t want to miss. For more information, check out Fin’s Bar on Facebook. 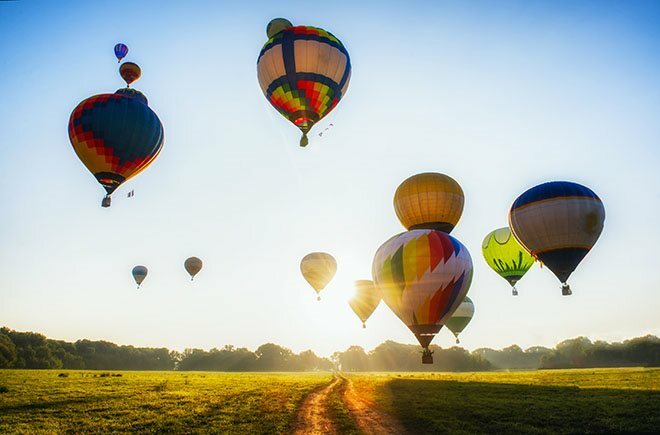 13TH ANNUAL GULF COAST HOT AIR BALLOON FESTIVAL May 4-6, Foley | More than 40 balloons will light up the fields and soar through the skies, May 4-6, during the 13th annual Gulf Coast Hot Air Balloon Festival presented by the South Baldwin Chamber of Commerce and Tanger Outlets. A family friendly event, the festival has activities for everyone! Festival admission is free with select activities for an additional charge. At the festival grounds, the whole family can enjoy carnival rides, tethered balloon rides, balloon glows, balloons in flight, arts and crafts vendors, food vendors, and live music and more! Balloons fly at dawn and dusk each day weather permitting. The festival kicks off on Thursday, May 4 with a balloon glow from 6-7pm, at Tanger Outlets located at 2601 S McKenzie St in Foley. The excitement moves to festival grounds on Friday, May 5 from 2-10 pm and Saturday, May 6 from 6am-10pm. On Saturday morning the first annual Color Dash 5k run will begin at the South Baldwin Chamber of Commerce, in downtown Foley, ending at the festival grounds! Runners will run through streams of color while the balloons take flight overhead! Come out and enjoy Mustache the Band and The Molly Ringwalds among other local favorites. Other highlights include a VIP area where, for a small fee, you’ll have a place to rest and enjoy freshly prepared heavy hors d’oeuvres, water, soft drinks and adult beverages. For more information on the Gulf Coast Hot Air Balloon Festival or to purchase Balloon Bucks, VIP passes, directions and parking, please, visit www. gulfcoastballoonfestival.com or call 251-943-3291 * All balloon flights and displays are weather permitting. Winds must be less than 5 mph to safely inflate balloons on the festival grounds. ORANGE BEACH WINE FESTIVAL May 13, Orange Beach | The Orange Beach Wine Fest is one of the most cherished tickets on the island. The festival showcases over 120 wines, three live music acts, food from distinguished local restaurants, boat tours of the bay, custom wine glass, custom wine bag, and even craft beer for the un-winies ...... all for only $45 if you buy before the event. Waves of Wine Fest begins at noon and we have live music for the entire event. Various local artist are chosen for their talent of blending sweet musical harmonies to the taste of the event. We also provide a seating area in front of the stage for those guest who started counting the number of wine samples they have taken. Every ticket holder is provided with a cruise around the bay during the event. Local boats will be arriving at the docks of Caribe Resort and will take you and your friends for a tour of the bay islands. The boats will be running during the entire day so you can enjoy the scenery at your leisure. We will also have several yachts docked for your viewing. Select local restaurants like Cobalt, Cosmos, Sunset Corkroom and Rum Sisters will be providing delicious hors d’oeuvres. Cheese and bread selections will also be available in a designated area. The event takes place at Caribe Resort, therefore Cobalt restaurant is next door for those who want something more substantial. GALLERY OF GARDENS TOUR May 19-20, Downtown Mobile | Explore nine charming gardens in three historic Mobile neighborhoods. In support of Mobile Botanical Gardens, residents in historic the Oakleigh Garden District, Church Street East and de Tonti Square are opening their gardens for the Gallery of Gardens2017. All the gardens are within a two mile radius, so put on your walking shoes or grab your bike and come see what can be done in seven courtyards and two larger spaces. Master Gardener docents will be available with plant lists and personal knowledge to tell you what is growing in each garden. Tour hours are from 10:00am – 4:00pm each day. Tickets are $30. For more info go to www. mobilebotanicalgardens.org. DRAGON BOAT FESTIVAL June 10, Mobile | Dragon Boat Racing is back in South Alabama for year four! Help Fuse Project impact more local children in 2017 by signing up to participate on Saturday, June 10th at USS ALABAMA Battleship Memorial Park! With origins dating back 2,300 years, dragon boat racing is a fun, unique cultural event featuring adrenaline-pumping action. Teams of 21 people race in authentic 46-foot long Hong Kong style dragon boats. Competitors rave about the excitement, friendly competition and community spirit surrounding the sport. All ages, skill levels and physiques perfect their stroke and timing for the ultimate teamwork experience! Fuse Project’s Dragon Boat Festival brings the most fun and unforgettable fundraising experience to the Mobile / Baldwin County area! See how well your team can compete against other local corporate and community teams – and who will win off the water raising money for children in our local community! From family friendly fun to a night out on the town we have so much to offer, take a look around our directory to plan your perfect vacation. Alabama Coasting Magazine is distributed through hotels, condominiums, bed & breakfasts, inns, and residential communities throughout Mobile and Baldwin Counties. This network represents more than 9,000 hotel rooms and vacation condos offering a potential monthly readership of some 40,000. It is also distributed through regional visitor information centers, area chambers of commerce and select high-traffic local businesses.